paid ads appearing in the search results. 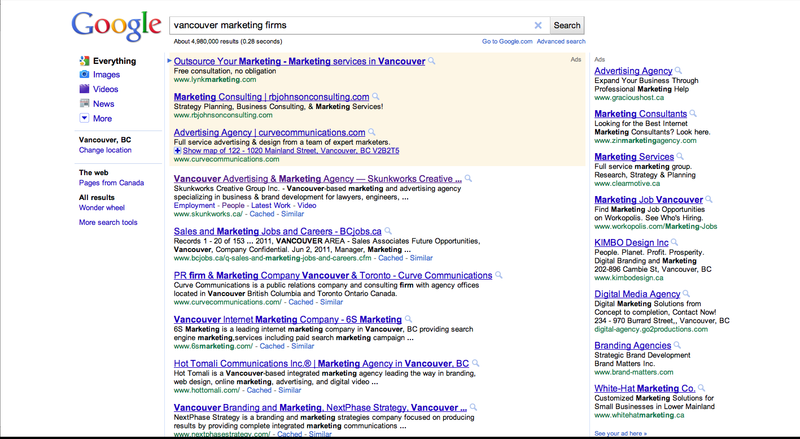 On the above screen shot of Google results for “vancouver marketing services,” the ads are the top 3 results in the center column and all of the results in the right sidebar. SEO is a murky area on which I’ll touch very briefly. SEO consultants and marketing agencies do their best to divine how search engines actually work. They then advise clients on how to update their sites or use external link building tools to improve rankings. Because Google never reveals its secret recipe and modifies the algorithm regularly, a best guess is as good as you can hope for. The Globe and Mail recently ran a series taking a closer look at at the SEO industry. Skunkworks builds websites according to Google’s best SEO practices. Beyond that, we find that the best determination of a high search engine ranking is high-quality relevant content. We do not and cannot promise a specific ranking in the organic search results. Nobody legitimately can. 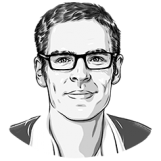 For all the high-tech hype around Google, its SEM business model actually fits very well within the traditional journalism/publishing industry. Ad placements cost money. Almost all of Google’s revenue is derived from these ads and Google is not the only game in town. Depending on your particular services, Facebook, LinkedIn, and the Microsoft Advertising Network are all viable pay-per-click options. As Google has shut the door on many illegitimate SEO practices (e.g. link spamming), SEM is increasingly seen as the most viable option for those with an advertising budget. Do you have capacity to take on more business? How long have you had your current website? Do you update it regularly? Are you happy with it? Are your services niche or do you compete in a retail practice (e.g. environmental class action vs. personal injury law)? Are you looking to increase clients within a preferred service area? How are your organic search rankings for your preferred keywords? In a newspaper, would you prefer to write an editorial (++time) or just buy an ad (++$$) on the editorial page? Is blogging the best use of your time? In an ideal world, your firm would appear prominently in the organic search results and SEM would not be necessary. In practice, it likely makes more sense to pay to play. The marketing strategy will always follow from your particular facts. Yes. Part of the appeal of SEM is that you only pay when someone actually clicks on your ad and is directed to your site. You’ll also get transparency into how often the ad appears (the impressions) versus how often someone clicks on your ad (the click-through-rate). Most people will click on a relevant search result whether its an ad or organic. We provide monthly reporting to our clients so that they have a good sense of what’s working and what’s not. Google’s click-to-call functionality, in which you can use your smart phone to call directly from Google’s search results, has proven particularly popular amongst our clients. Unlike selling LCD TVs, the point of conversion for professional services firms is when a potential client calls the firm to setup an appointment and/or retainer. Five years ago, Google AdWords campaign management was simple. You could set it, forget it, and wait for new clients to call. All you needed was a credit card. As these things go, Google’s developers roll-out new features (to their credit) almost daily and the cumulative result is that AdWords is now very complicated. Not only does the core AdWords interface look like NASA’s mission control display, but effectively managing a campaign means making ongoing tweaks to reduce costs and optimize your clicks. While Google offers training through webinars, message boards, and tutorials, the time required for developing a basic AdWords skillset has become cost-prohibitive for most small and medium-sized businesses. In other words, SEM has been professionalized. Spending money on search engines doesn’t make sense for everyone. If you have a strong offline brand, your marketing resources may be better spent elsewhere. Where our services are appropriate, Skunkworks offers SEO/SEM management retainers. I’ll be blogging on this subject on a regular basis. Next-up…LinkedIn Ad Campaigns for Professional Services Firms.